“The world has failed us,” says Ecuadorean President Rafael Correa. Only $13 million has been raised. Last week, Correa liquidated the trust fund and ended the innovative initiative. Oil exploration, he says, will impact about 1% of the park. 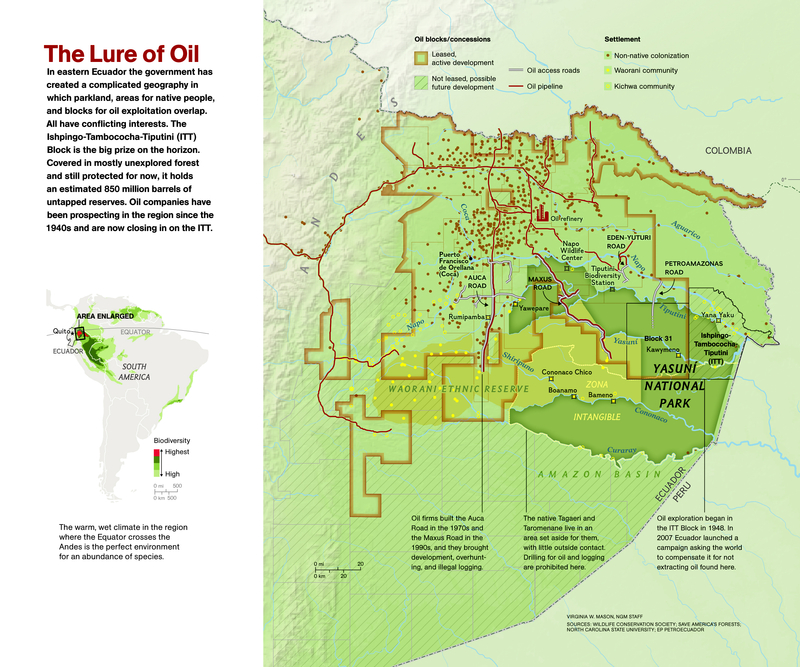 This beautiful National Geographic map—click to enlarge—displays the competing interests of stakeholders in eastern Ecuador: indigenous peoples, foreign oil companies, and environmental groups. Read this National Geographic magazine article on Yasuni National Park. In it, one researcher says that “in areas impacted by oil development, perhaps 90 percent of the species around denuded sites die. ‘You have to ask: Is that acceptable? To whom is that acceptable? '” How would students answer these questions? Can they identify some of the different stakeholders affected by oil drilling in Yasuni? Are these stakeholders valued equally? Why or why not? Most Ecuadoreans do not support drilling in Yasuni, and President Correa says he did not want to abandon the plan to prevent it. “It was not charity that we sought from the international community, but co-responsibility in the face of climate change,” he said. Do students agree? How do students define the “international community”? Individual governments? Non-governmental organizations (NGOs)? Inter-governmental organizations (IGOs)? Do students think the international community is responsible for preserving the “lungs of the world”, or is it the responsibility of those communities in the Amazon basin? Why? Why do students think most nations rejected President Correa’s plan to collect money to preserve Yasuni? “Now there is really no viable alternative to stop the wave of drilling slated for the most biodiverse region of the world,” says Matt Finer, a scientist with the Center for International Environmental Law. Do students agree? Can they think of other alternatives to drilling in the Amazon? We have a similar discussion in the UK many different drilling companies are applying for permission to conduct Frack drilling. There are some who are just looking to make money and others that are prepared to discuss their drilling intentions with the local community. One such company delivering presentations is http://www.piling-equipment-ltd.com. What they say makes sense and worth listening too.